HD Tune Pro is an extended version of HD Tune which includes many new features such as: write benchmark, secure erasing, AAM setting, folder usage view, disk monitor, command line parameters and file benchmark. The benchmark measures raw performance in a couple different ways to measure a hard drive for Read and Write tests, which are conducted separately. To read the results below consider that highest minimum/maximum/average transfer rates are better, while lower (quicker) access times are best. Lastly, highest burst rates are better. In HDTune' s Read Tests the 750GB Seagate Momentus XT SSHD achieves a read burst rate of 155.9 MB/s and an average read transfer rate of 90.7 MB/s. Access times are very low, 0.615ms, most likely due to the Adaptive Memory messing with this benchmark (we saw different results each test). 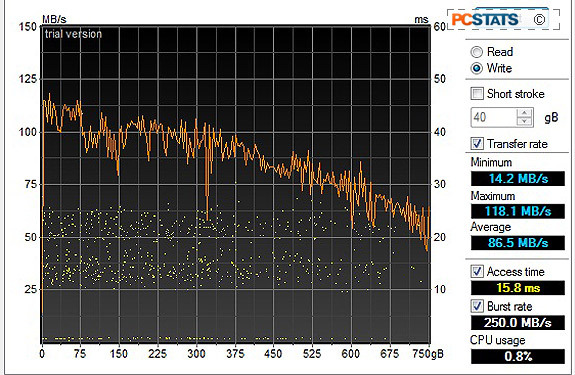 The write tests in HDTune illustrate similar points with the 750GB Seagate Momentus XT SSHD. Transfer rates for the 2nd Gen. Momentus XT improve over the 1st Gen Momentus XT, as expected, thanks to the updated SATA III interface of the former. The 750GB Momentus XT achieves a very nice write burst rate of 250 MB/s and an average write transfer rate of 86.5 MB/s.